doi:10.4236/jbise.2010.37093 Published Online July 2010 (http://www.SciRP.org/journal/jbise/). Received 7 May 2010; revised 23 May 2010; accepted 25 May 2010.
rich set of avian-human or swine-human markers [1-7]. had minimum impact on this new virus. 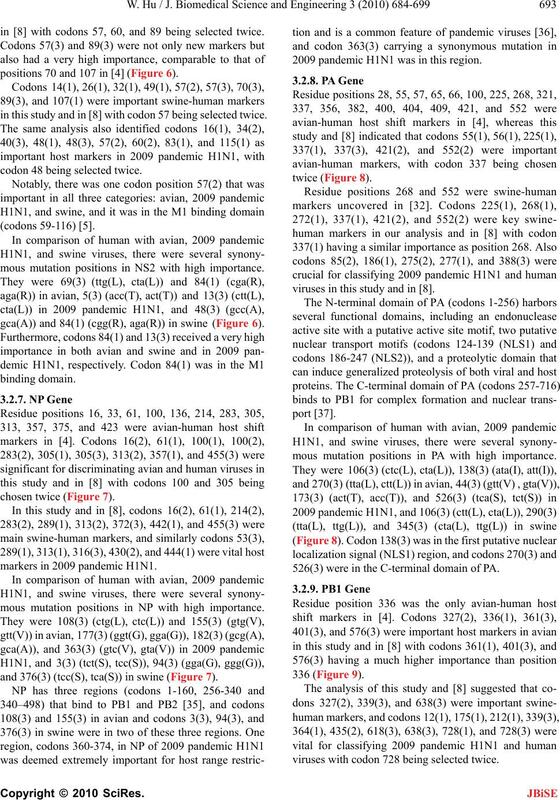 avian and swine viruses were also included in this report. PB1-F2 protein for this new virus. codons for enhanced translation speed and fidelity. acid is equally likely to be encoded by any of its codons. used in the study were aligned with MAFFT [16 ]. has been demonstrat ed in va rious studies [19-24]. remarkable feature that amino acid markers lack. firmation and refinement of the results in . and 254(3) (gga(G), ggg(G)) in 2009 pandemic H1N1. codons than the HA2 domain (Figure 1). mous mutation positions in NA with high importance. avian and swine (Figure 2). 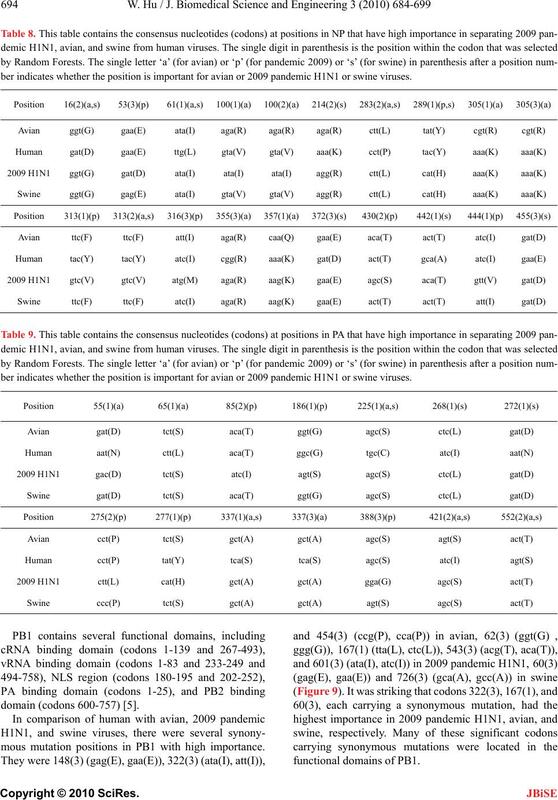 a position number indicates whether the position is important for avian or 2009 pandemic H1N1 or swine viruses. pandemic H1N1 with codon 30 being chosen twice. mous mutation positions in M1 with high importance. isk are the important residue positions identified in . and 180(3) (gta(V), gtt(V)) in swine (Figure 3). packing and formation of virus particles [3 1]. 93(2) carrying a high importance. 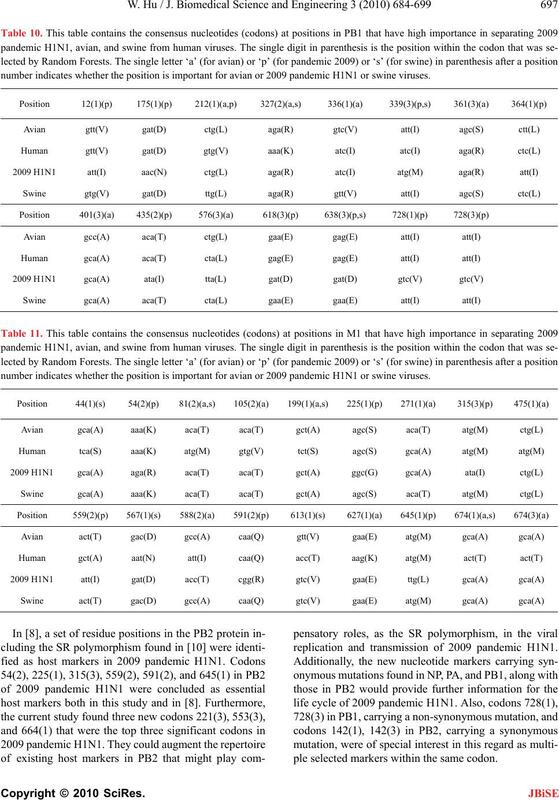 number indicates whether the position is important for avian or 2009 pandemic H1N1 or swine viruses. demic H1N1 in this study and in . mous mutation positions in M2 with high importance. gta(V)) in swine (Figure 4). the host cellular antiviral mRNAs . were located in the C-terminal region. mous mutation positions in NS1 with high importance. H1N1, and 146(1) (cta(L)), (tta(L)) in swine (Figure 5). in  with codons 57, 60, and 89 being selected twice. positions 70 and 107 in (Figure 6). in this study and in  with codon 57 being selected twice. codon 48 being selected twice. 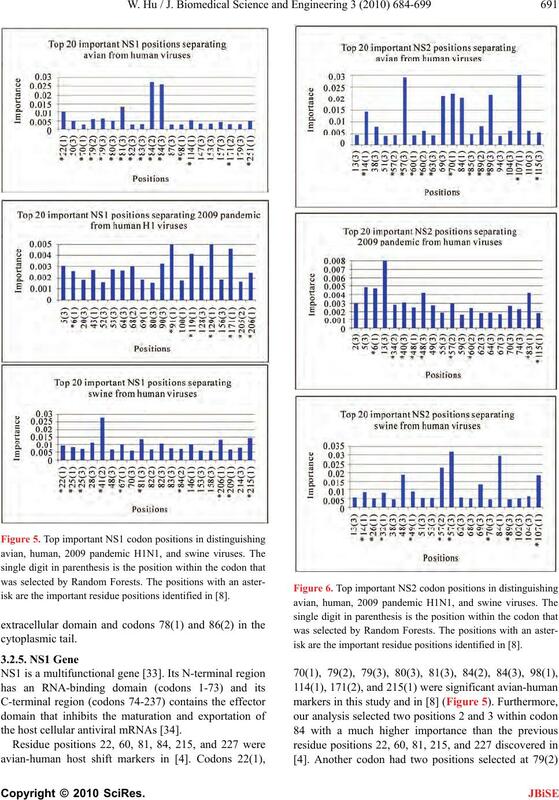 mous mutation positions in NS2 with high importance. gca(A)) and 84(1) (cgg(R), aga(R)) in swine (Figure 6). 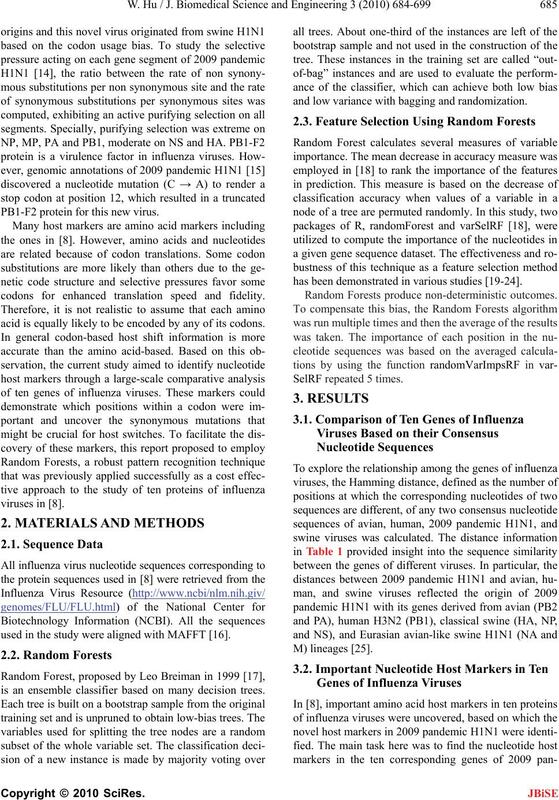 markers in 2009 pandemic H1N1. mous mutation positions in NP with high importance. and 376(3) (tcc(S), tca(S)) in swine (Figure 7). 2009 pandemic H1N1 was in this region . viruses in this study and in . mous mutation positions in PA with high importance. 526(3) were in the C-terminal domain of PA.
viruses with codon 728 being sel ected twice. ber indicates whether the position is important for avian or 2009 pandemic H1N1 or swine viruses. domain (codons 600-757 ) . mous mutation positions in PB1 with high importance. well-known host marker ( Figure 10). ers in 2009 pandemic H1N1. mous mutation positions in PB2 with high importance. in the PB2-PB1 and PB2-NP binding domains. ing extra and finer information abo ut the ho st ad aptatio n .
determinant for adaptation from avian to human hosts. another possibility in the th ird pos ition within codo n 627.
replication and transmission of 2009 pandemic H1N1. ple selected markers within the same codon. 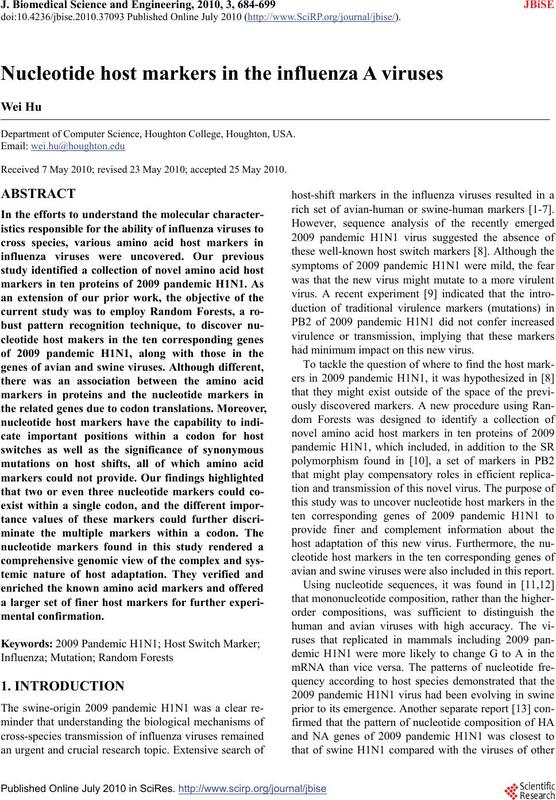 ing avian, human, 2009 pandemic H1N1, and swine viruses. asterisk are the important residue positions identified in . elucidate their biological functions in cellular processes. Allen, J.E., Gardner, S.N., Vitalis, E.A. and Slezak, T.R. enza pandemic strains. 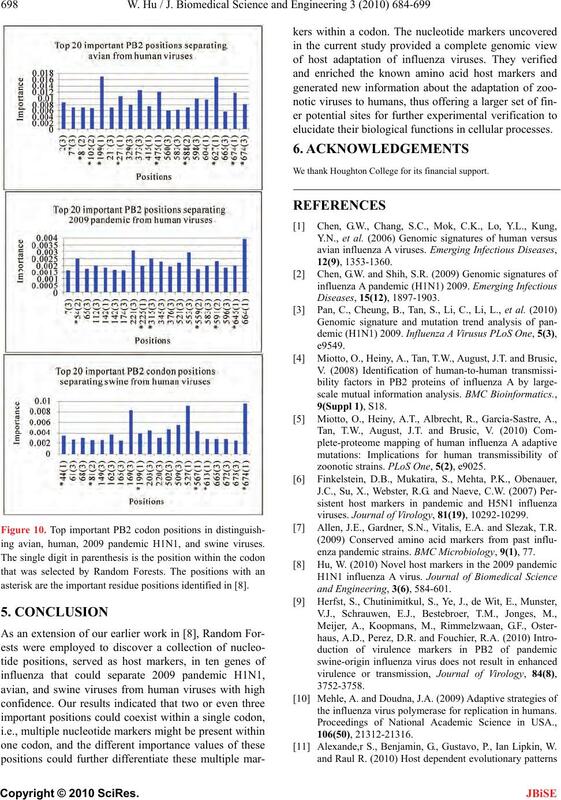 BMC Microbiology, 9(1), 77.
the influenza virus polymerase for replication in humans. 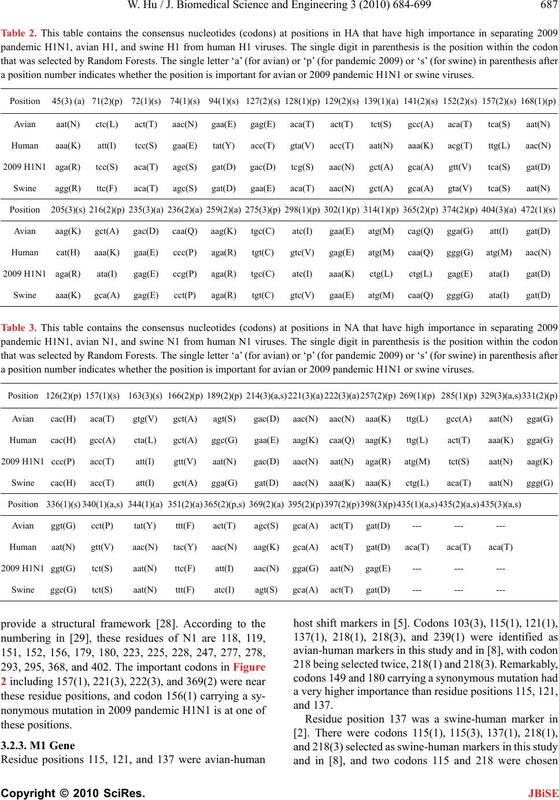 Alexande,r S., Benjamin, G., Gustavo, P., Ian Lipkin, W.
sequence alignment. Nucleic Acid Research, 33, 511-518.
random forest. BMC Bioinformatics, 7(3), 3-16. Reif, D.M., Motsinger, A.A., McKinney, B.A., Crowe, J.E. Gavin, J.D., Smith, D.V., Justin, B., Samantha, J.L., et al. of Biomedical Science and Engineering, 3(3), 227-240.
magglutinins. Virus Genes, 24(1), 57-63.
minidase. 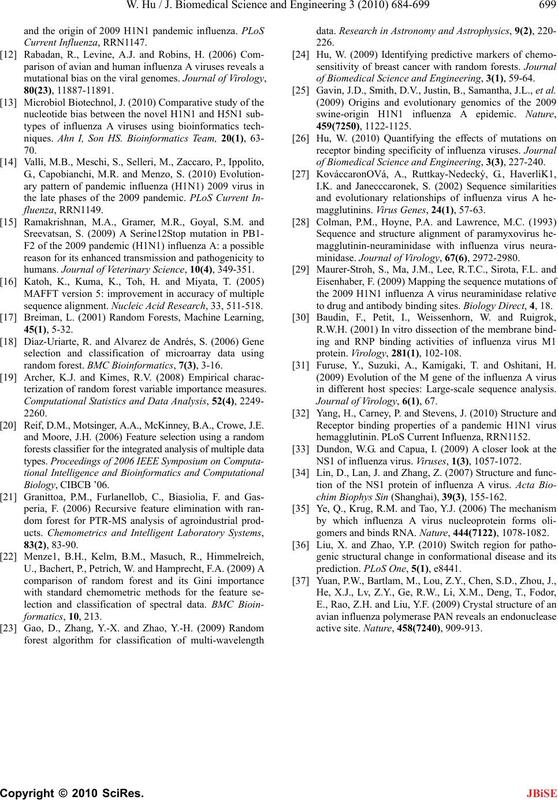 Journal of Virology, 67(6), 2972-2980.
to drug and antibody binding sites. Biology Direct, 4, 18. Journal of Virology, 6(1), 67.
hemagglutinin. PLoS Current Influenza, RRN1152. NS1 of influenza virus. Viruses, 1(3), 1057-1072.
gomers and binds RNA. Nature, 444(7122), 1078-1082.
active site. Nature, 458(7240), 909-913.